Happy Friday! I hope your week went as fast as mine and you enjoyed it! Today I have a throwback artist that enhanced a movie that you may know very well. From the soundtrack of Coyote Ugly is LeAnna Rimes "Can't Fight the Moonlight." Although LeAnna covered other various songs throughout the film, this one symbolizes the end of the movie of the lead actress Violet, Piper Perabo, finally starting her singing career which was the goal of the entire movies. Through the trials and tribulations she faced, the importance of this song is that with the help of everyone around, she finally made it. I truly hope you enjoy this weeks song and enjoy the Coyote Ugly soundtrack mostly covered by LeAnna and watch Piper Perabo on ABC's Notorious every Thursday at 9pm. Have a great weekend! Global Perspectives is back on the air. Host Joseph Jorjoliani has been away for a long time for his study abroad in Germany. Now as he is back to Washington and Jefferson College, he started the last season of his show "Global Perspectives with Joseph Jorjoliani". Last Friday he hosted international student- Louis Affor from the United Kingdom. Louis talked about his experience in UK, how he selected a university far away from home; he is from England but attends University of Aberdeen in Scotland for his undergraduate degree. Louis will spend one year at W&J and will be a great addition to Washington & Jefferson's Men's Rugby Club. You can check more on Louis Affor on Global Perspective's Mixcloud page. I saw Bastille for the first time two days before I graduated high school, and I'm pretty sure I enjoyed that concert more than I enjoyed my graduation. Since then, I've seen Bastille in Cincinnati, in Columbus, and twice in Chicago - all during tours on the same album and the album's re-release. "Bad Blood" is an essential album for today's alternative music fan, and "Wild World" is certainly just as impressive. There are a few songs on "Wild World" I already knew word-for-word upon the album's release because Bastille had performed them for years prior to releasing them - "Blame" and "Campus." There are a few songs I learned just from seeing Bastille twice over the summer leading up the the album's release - "Lethargy," "Power," and "Send Them Off!" And of course, I knew "Good Grief," the first single released from the new album. However, I was still ridiculously excited for the album's official release because every Bastille song has an entirely unique personality created by the lyrics, the emotion in Dan Smith's voice, and the incredible instrumentals from the rest of the band. "Wild World" is an album you don't want to sleep on - go have a listen if you haven't already! Listen To: "Don't Stop Making It Happen," "Welcome to Your Life," and "Enlighten Me." Young the Giant - "Home of the Strange"
Listen To: "Silvertounge," "Amerika," "Something to Believe In"
To hear some of these songs and more of our favorite alternative and electronic jams, tune in to WNJR Mondays at 9 PM for "Bad Dance Moves!" Happy Monday wonderful peeps! I hope everyone is ready for today's celebrity from the grave: Ray Charles everyone! Ray Charles was a famous pianist, singe, and songwriter. After witnessing the traumatic death of his younger brother, Charles began losing his eyesight. Completely blind at the age of 7, Charles' mother sent him to school for the blind. His first hit single was Mess Around and a year later I Got A Woman became his No. 1 hit. For more information on Ray go here. You can also catch some of Ray's tunes on the radio here or 91.7FM. But until then here's Ray Charles' Mess Around. What is so amazing about Lauren Palmer is that she has never let her admirers down. She is constantly working either in her acting career or her musical career. I am spotlight her this week because she has recently been making music that resonates with me. For example "Many Things" which highlights her summer of making a movie coming soon and interacting with fans. I think she is an underrated artist because all of the facets in her life are not highlighted yet she excels in all areas of her life. Happy Friday! I hope your week went well and to get your weekend off to a great start here is a collaboration video from Conor Maynard. This mashup is a mixed melody ranging from R&B to Hip Hop displaying not only the incredible sounds of these songs put together, but also the incredible ranging tones of Conor. I truly hope this gets you excited for the weekend and check out the rest of his videos by following the link to his page at the end of the video. Listen to Sonny Rollins hits on WNJR 91.7 FM or click Listen now. Sonny Rollins is an American s an American jazz tenor saxophonist. Rollins is recognized as one of the most influential jazz musicians. Throughout his seven-decade career, he has recorded at least sixty albums as leader and a number of his compositions, including "St. Thomas", "Oleo", "Doxy", "Pent-Up House", and "Airegin", have become jazz standards. WNJR offers some pieces of his Road Show album "Holding the Stage". Enjoy Sonny Rollins on WNJR and stay tuned for more. Hey everyone! I hope you all had a wonderful summer and you're ready to get back in the swing of things! A lot of great electronica albums were released this summer, one of them being AlunaGeorge's album "I Remember." AlunaGeorge are an English electronic duo, consisting of members Aluna Francis, who is on vocals and songwrites, and George Reid, who produces and provides the instrumentation. 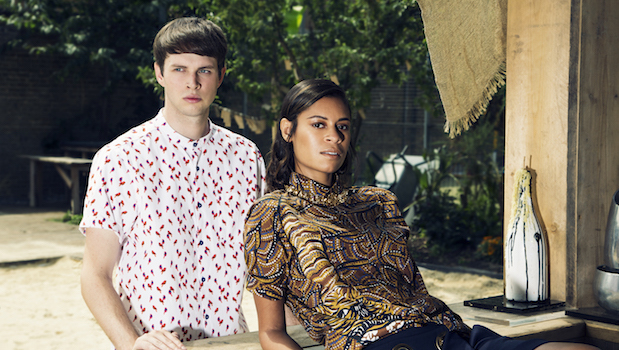 You may have heard of AlunaGeorge featured in the songs "White Noise" by Disclosure or in "You Know You Like It" which was a collaboration with DJ Snake. Aluna Francis also helped to write Justin Bieber's "What Do You Mean." The duo produces music that is a combination of electronic and R&B sounds and can be heard in songs like "I Remember," "Not Above Love," and "Mean What I Mean." These songs can all be heard on the new album, so be sure to check them out! If you wanna hear AlunaGeorge and other artists like them then don't forget to tune in on Monday nights at 9PM for Bad Dance Moves! Hello everyone! School has started and along with it WNJR, whoo-hoo! With that, I'll be writing a new weekly blog about the musical genius of deceased artists, whom we keep in our music library. Today is about the wonderful, Whitney Houston. Whitney was known for her powerful vocals in hits such as I Will Always Love You and How Will I Know. Houston hailed from New Jersey, releasing her first album when she was just 22, giving her three No. 1 singles. She was married to singer Bobby Brown. Whitney has starred and songs featured in several movies. More information about Whitney can be found here. To hear some of her angelic vocals tune in here or 91.7FM, but in the meantime here's a live performance of Whitney's Do You Hear What I Hear. The WNJR Staff is exciting to be back in the radio station hosting shows and letting our listeners know what's new! This year is full surprises with returning host and new host, giving WNJR a great array of music selections and topics on the radio. The "Sonnieside up Show" with uncle and Sonnie and Nephew Dom has caught campus by storm! They have already started shows and given out T-shirts to supporters make sure to tune in and see what the fuss is about on Tuesday at 10pm. Be sure to listen more regularly for some familiar voices like "21st Century Girl" with Carmen J. Carroll and "Bad Dance Moves"with Danielle and Jess. And new voices!